Scotland First Minister, Nicola Sturgeon, took a cautious line on Catalan independence. She hoped that “dialogue will replace confrontation”. She called for a way forward that “respects the rule of law” and also “respects democracy”. She refused to say if the Scottish government would recognise the result of the disputed referendum.” She told Andrew Marr “I consider myself a friend of Spain”. Spain is nothing in this context but its ruling class exercising political power through its crowned Unionist ‘Francoist’ state. Sturgeon is giving comfort to the enemies of the Catalan people in the hope that ‘Spain’ will be more favourable to the Scottish government’s quest for independence under the Crown. The leaders of the SNP want to keep friends with the Queen of England and the King of Spain. The parallels with the 2014 Scottish referendum are significant. The national democratic movement in Catalonia has declared in favour of a republic and this was spelt out on the ballot paper. In a Spanish context the Catalan republic is revolutionary not least because it goes back to the 1930’s when the Spanish republic overthrown by Franco. In 1934 the Catalan President Lluis Companys was jailed after declaring a Catalan Republic. Later he was captured by the Nazis and shot by one of Franco’s firing squads in 1940. Spain is a Unionist state and constitutional monarchy like the UK. The national question is the lever for republicanism and democratic revolution. There is no right to self determination in a Unionist state like Spain. The Spanish constitution is against it. The attempt to hold a referendum was thus illegal. Naturally the Spanish government sent in the national police to uphold the law by closing down the polling stations and beating up those trying to vote. They could have sent in the army and tanks to stop the ballot. But they chose a more moderate option. Liberal opinion was outraged but did nothing. British Unionism is no better. The Scottish people have no right to self determination. They have no more legal right to referendum than the Catalan people. The British crown, acting through its first minister David Cameron, decided to grant a referendum because he calculated he would win it. The Queen kept a low profile whilst letting it be known what every loyal subject should do. The Spanish King was not so reticent and came openly in support of his ‘Tory’ government. The democratic forces in Catalonia had to face the full weight of the Spanish state, the banks and major corporations, and the European Union. The threats of economic sabotage and expulsion from the EU followed the Scottish example. If Catalonia became a republic then hell fire and damnation would rain down on them. We must support the right of the Catalan people to hold a referendum on independence. 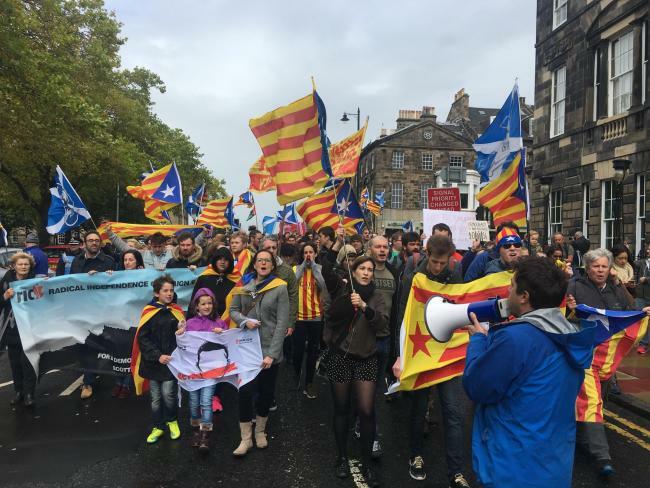 The Catalans, like the Scots, are a politically oppressed nation because the Union with Spain is not voluntary, as the violent intervention of the Spanish police showed. But supporting the right to hold a referendum does not mean supporting the republic. The second issue is whether a Catalan republic would be a progressive democratic step forward from the Unionist monarchy. The answer is yes. A republic is a democratic and revolutionary break with the Francoist-Monarchist state. This is why all the reactionary forces in Spain and the EU are opposed to it. British Unionists are worse than their Spanish imitators. They like to pretend that Scotland has a legal and constitutional right to self determination. It has no such right. Neither the Scottish people nor a Scottish government can hold a legal referendum. If they hold an illegal one, they have to organise the forces necessary to defend the polling stations. In Ireland and Spain, Unionism and Republicanism are diametrically opposed, engaged alternately in hot and cold warfare. In Scotland, the national democratic movement is not republican. The SNP are moderate constitutional nationalists. They want to keep the Queen as head of state in a post independence Scotland. This is aimed at convincing the capitalist class that independence will not destabilise their hold on economic power or weaken their political influence. The Catalan republic is a reality which the Scottish republic is not. Good article. The incredible depth and scope of community and neighbourhood popular organisation in Catalonia ensures that the regional Catalan government is under peoples’ accountability and make sit hard to backtrack. The Scottish Left began down this same road during the Referendum campaign, by the excellent registration campaign among sections of the working class that had been voiceless for so long. The incredible turnout and close result was the product of the upsurge in politicisation that came from this. Even so, Sturgeon is not under anything like the same need to answer to popular pressure as Puigdemont and is yet to part ideologically with either Monarchism or the City of London’s £. Today, EU chief Executive Junker expressed his fear that the challenge of secession to the existing unionist states fronted by Catalonia could end up replacing 28 member states with an ungovernable 98. Bring it on!! !